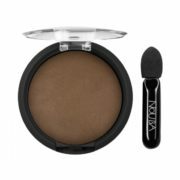 Nouba - Nombra - 334 - 409EyeshadowA super blendable, baked shadow with a velvety effect and micronized pigments for creating endless looks from natural to highly artistic. The eyeshadow gives an immediate payoff and perfect blending. The color shades easily with the special applicator. Try all shades!